Interesting use of sports tape reduce pain. Pain is triggered when the brain concludes, rightly or wrongly, that body tissue is in danger and action is required. Lots of areas of the brain are involved in pain which is why things like memories and smells can trigger pain. Pain cause loss of mobility and damages sleep which significantly reduces quality of life. 35% of people with Haemophilia surveyed in Europe in 2012 suffered from chronic pain. The “find and fix” approach to medicine isn’t well suited to chronic pain which often has complex causes. No part of the body can send pain signals, only danger signals; the brain interprets it as pain. Therefore, your mental and physical state can make you more likely to experience pain. Levels of pains are always subjective. Traditionally, opioid drugs have formed the backbone of treatment for chronic pain. However, many patients worry about toxicity and becoming dependent. It is now thought that in many countries opioids are over prescribed. If used long term then they can cause constipation, vomiting, apathy, mood swings and loss of concentration. There is a lack of research on the treatment of chronic pain in people with bleeding disorders. However, good pain management should start with a pain assessment and often involves keeping a pain diary so a wide range of factors can be analysed. People with bleeding disorders can find it difficult to distinguish between a reoccurring bleed and pain from existing joint damage and should talk to their centre if they are in doubt. Physiotherapy can play an important role in reducing chronic pain. Improving movement and posture can have a positive impact on pain. Increasing the strength do the muscles around a painful joint can reduce the pain. 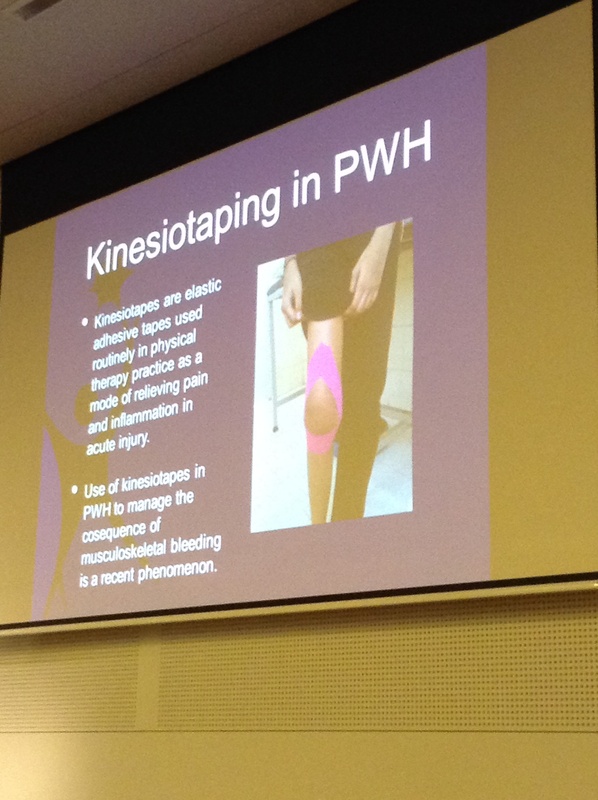 One speaker had found sports tape (Kinesiotape) very useful in tackling pain in people with Haemophilia. Another speaker highlighted the role of techniques such as complimentary therapies, positive thinking and psychosocial interventions in pain reduction. She also mentioned self hypnosis and stressed the importance of taking medications as scheduled and not only when you feel pain.